Water filter taps are designed for filtered water dispensing, and are installed next to your regular hot and cold water tap. 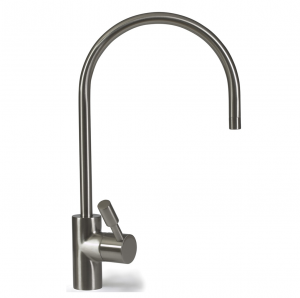 Single-dispensing water filter taps come in a variety of finish options and styles, so you can match the design of the tap to the style of your kitchen and kitchen sink. The Osmio Robin Water Filter Tap Faucet is a premium quality stainless steel tap that is sure to be in the spotlight in any modern kitchen. This Osmio filter tap is a pocket-friendly option for anyone looking for an elegant filter tap that is durable, easy to clean, and has a lovely matt chrome finish. The Robin model will perfectly complete any modern or minimalistic style kitchen. 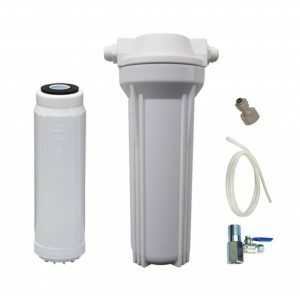 The Osmio Ultra-Soft 3 Way Tap Filter Kit is both a scale-inhibitor and contaminant removal water filter that can be used with any 3-way kitchen tap. It’s a convenient alternative for when you need to deal both with water hardness issues and common tap water contaminants, but you don’t want to install a water softener in addition to a water filter. This 3 way tap filter kit has a dual action by reducing water hardness and removing contaminants. In this review, we’re going to discuss the mechanism behind the dual action of this Osmio 3 way tap filter kit and analyse whether you should consider this filter for your kitchen. Manufactured by a veteran of the filtration industry, Watts Water Technologies, the EZFITPRO-100 is an under-sink water filter that works as an inline filter. 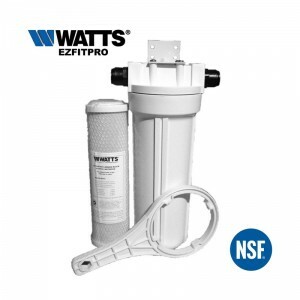 The Watts EZFITPRO-100 Undersink Water Filter Kit uses top quality NSF Certified materials (water filter cartridge, filter housing) and WRAS certified 15 mm John Guest push fittings. A notable advantage of this under-sink water filter is that it allows you to keep your existing kitchen tap for high-quality filtered cold water. Another advantage of the EZFITPRO is its low annual running costs that amount to £20, based on 6 monthly filter changes. The Ecopure Eco-8 Inline Water Filter is not just about making tap water taste better, this under sink water filter also makes tap water clean to cook and safe to drink at a whole new level. The Ecopure Eco-8 water filter is easily incorporated in-line to your main kitchen tap, removing the need for a separate dispenser for filtered water. The Ecopure Eco-8 can also be connected to your fridge or water cooler for instant access to cold filtered water. By using a unique, dual stage filtration process, the Ecopure inline water filter produces soft, non-scaling drinking water. Apart from removing lime-scale, due to its 1 micron filtration, the Ecopure Eco-8 absorbs chemicals and kills bacteria and remineralises water. Chlorine is removed in 99% in both hot and hold water. The Ecopure Eco-8 is also effective in filtering out THMs, fluoride, PCBs, lead, barium, arsenic, cadmium, chromium, selenium, iron, copper, mercury and other heavy metals. In addition, the Ecopure Eco-8 inline water filter also removes and reduces pesticides and chemical solvents, as well as hormones and bacteria (including E-coli, Pseudomonas). 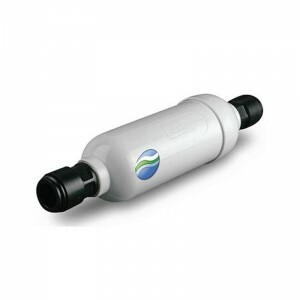 This all-round filtration ensures superior taste, safety and clarity of drinking water. 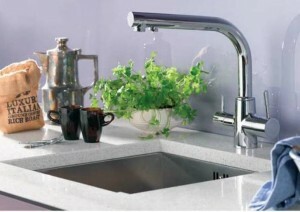 Are you looking for a stylish but practical 3-way water filter tap for your new or old kitchen? The BRITA Dolce 3 Way Tap Tri-flow Water Filter Tap may be just what you are looking for! Featuring a 3-way dispenser and an overall classic design, this 3-way kitchen tap will not go unnoticed in your kitchen. The BRITA Dolce Tri-flow Water Filter Tap starter set contains the Brita P1000 water filter cartridge, which reduces lime-scale, chlorine and chlorine flavours, as well as metals such as copper or lead through a multi-stage filtration. You can enjoy the tasty and fresh BRITA filtered water in an easy and convenient way straight from the 3-way dispenser.